I mentioned yesterday that I haven't taken any pictures this week, and we haven't had much "extra" going on. But I DID install the Instagram app on my iPhone recently, and I've been trying it out a little bit. Of course, the first, oh, 15 pictures or so that I took, I accidentally didn't save. I didn't realize that if you take the picture and then hit "Back," it deletes the picture. Old phone didn't do that. Oops. This week I think I finally got it all figured out, and last night I tested it out by taking some pictures of a regular old, boring, nothing-happening night around the house. Now that I've given it that great build-up, let's see if it can live up to the hype! I actually Tweeted this one, which is a shot of Jakey eating supper. How old is too old to stick your kid in a high chair? 10? 11? Yeah, that's what I thought. He barely fits, and I can hardly get him out of it -- especially in my current condition -- but he'll only sit still at the table for about three minutes, so I'm using this while the usin's good. 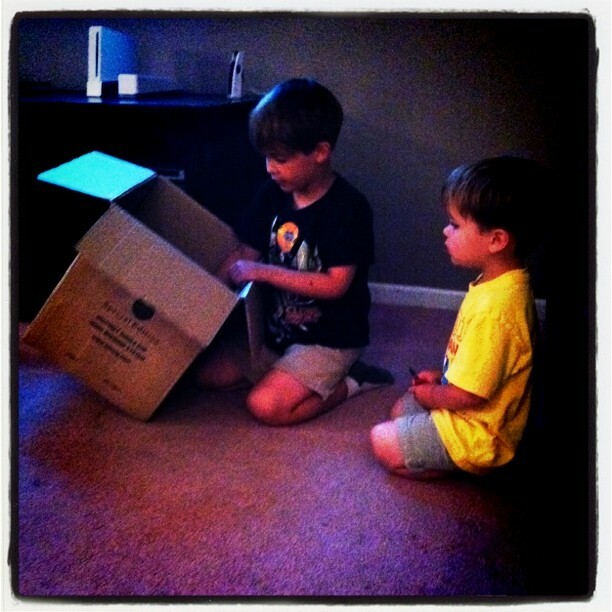 After I dislodged Jakey from the high chair, we went into the den, where they'd set up their Beyblades in the cardboard box they'd asked me for. A homemade arena, if you will. What? Never heard of Beyblades? YOU POOR THING. A word of caution: never let your children watch the show or buy any of the toys. I don't know how mine heard about them, but now we are all apparently DIEHARD FANS. 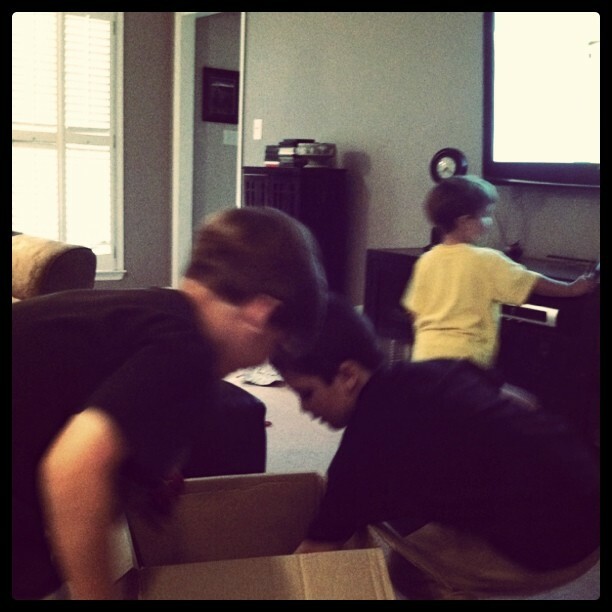 I argued against the boys spending their allowance on them, but they insisted. I told them they'd be like all the other junk they buy, which is to say, they'd play with them for a few days and then the next time I saw them it would be because I was ripping them out from the very soft underside of my foot since they'd been left in the middle of the floor, forgotten. 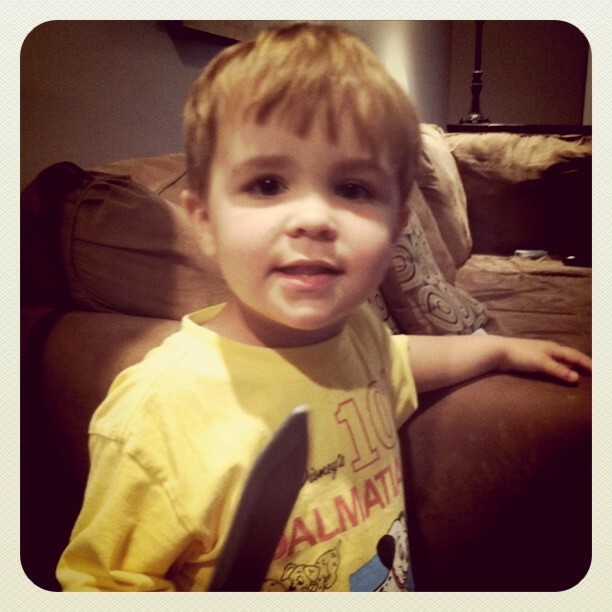 Right before I took that picture, Nathaniel said, "See, Mommy? These were TOTALLY worth the money! We're still playing with them!" And I said dryly, "You've had them for a whole 22 hours. Let's give it another day or two and see where we are then." 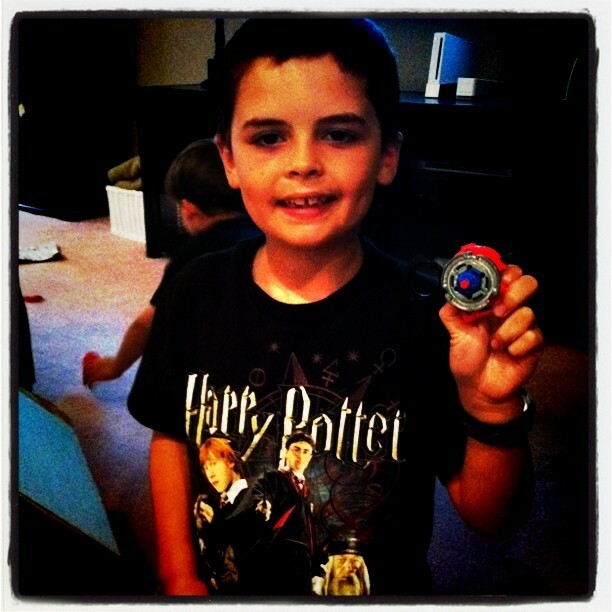 Beyblades are another thing Grayson wishes he'd had the foresight to invent. "They took like the world's second-oldest toy, the TOP, slapped another piece on it, created a cartoon to promote it, and now they're billionaires. Nice." 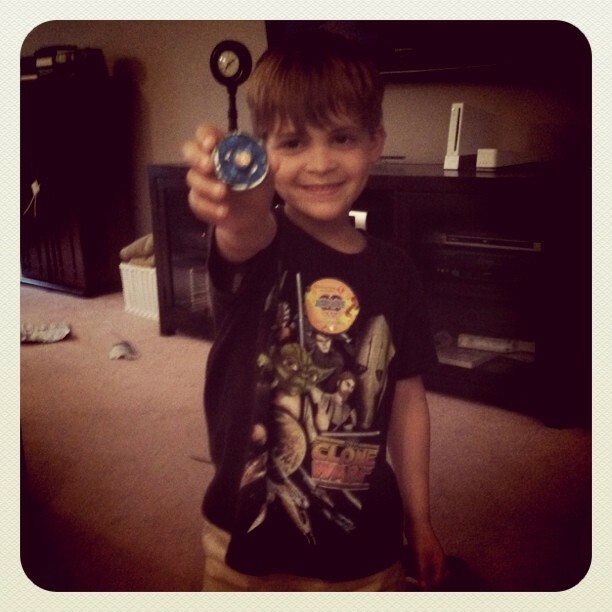 Since Jake won't get an allowance until he starts Kindergarten, he didn't get to buy a Beyblade. (Shh. Don't tell him he has money in his piggybank.) He contented himself with holding his scabbard, watching the big boys play and helping them count down loudly: "THREE-TWO-ONE, LET IT RIP!" 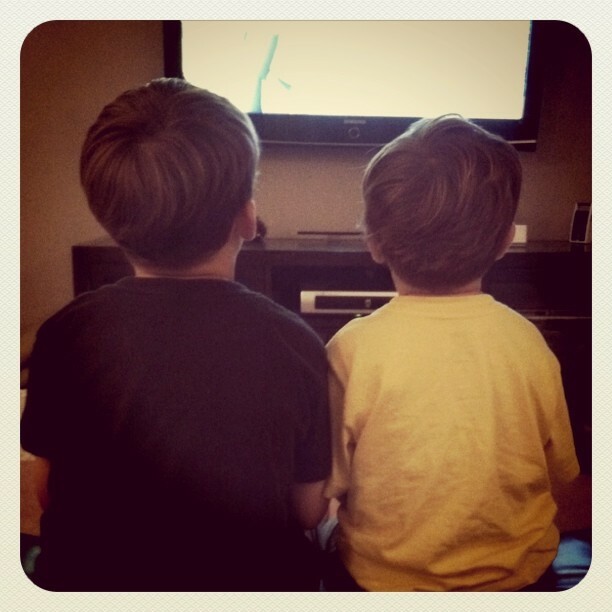 And we finally capped off the evening with a partial viewing of a new Curious George movie they found on Netflix. So there you have it ... our evening captured by Instagram. Can you tell I haven't decided which treatment I like best? There are a bunch to choose from every time you take a picture, and I have no idea which one I prefer yet. Perhaps over the weekend I'll figure it out. I clearly need to wake up more before reading blogs - I thought the title of this post was "An Interesting Evening" and kept waiting for something bad/not good to happen - glad it was an instagram evening - and hope they like those toys for more than 22 hours! 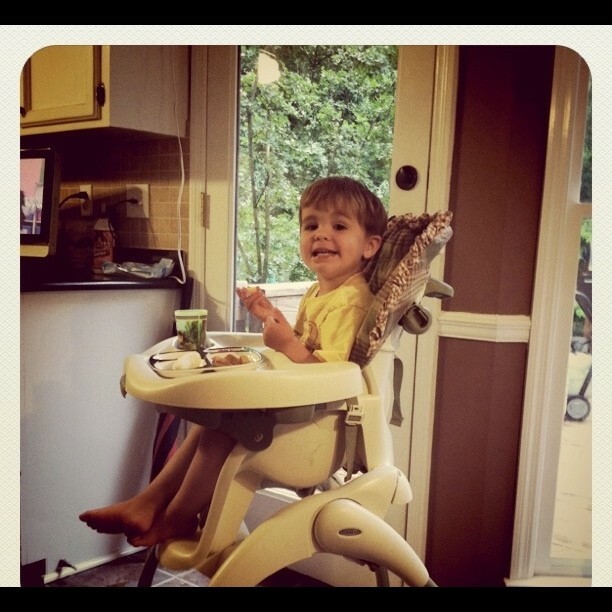 I like the one of Jake in the high chair. It looks like a picture my mom took of my brother back in the sixties.